Sunday was Cute W’s birthday, and we ended up having an impromptu lunch party at Dinosaur Bar-B-Que in Troy. We’d visited the one in Rochester, but this was my first time here in Troy. Yes, I know: I try all these vegetarian and vegan recipes (like here and here), but the truth is, I love me some BBQ. So I was excited to visit and it didn’t disappoint. If you’re BBQ-inclined, I presume that you have your favorites already. Among our party, the adults were enthusiastic about the appetizer sampler platter, especially the fried green tomatoes and wings. Here are some kids-in-the-restaurant-specific information that I gleaned from our visit. First, they officially open at noon, but when I arrived at 12:01 pm there were people already seated with food, so you do the math. They don’t take reservations and they’re always busy, so timing is crucial. My more-prompt friend said that she saw people literally running through the parking lot to beat out other diners. It’s pretty frightening what big slabs of smoked pork can do to people. Anyway, we were quite fortunate because with a grand total of 20 people, they opened up the small party room to the right of the foyer. 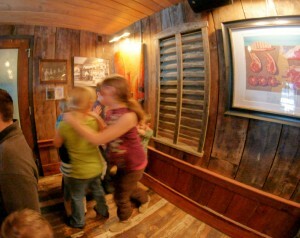 There were three large tables, two small tables, and just enough space for a small conga line when the kids (10 of them altogether) got rowdy toward the end. Obviously, we wouldn’t normally allow such shenanigans, but the room gave us a little freedom and made lunch much more relaxing in general. The service was excellent. First the servers doled out coloring page/kids’ menus & crayons, and the children fell upon them with such concentration that it was comical. Seriously, I’m wondering if modern children have been trained to have this Pavlovian response when they get to chain restaurants, as if perhaps they fear that the food won’t arrive if they haven’t colored the placemat menu with proper diligence? The servers were also attentive with kid-savvy details like determining who got custody of the pitchers of drinks (not the kids), putting the kids’ orders in first, and providing little wet-naps for a pre-lunch wipedown. 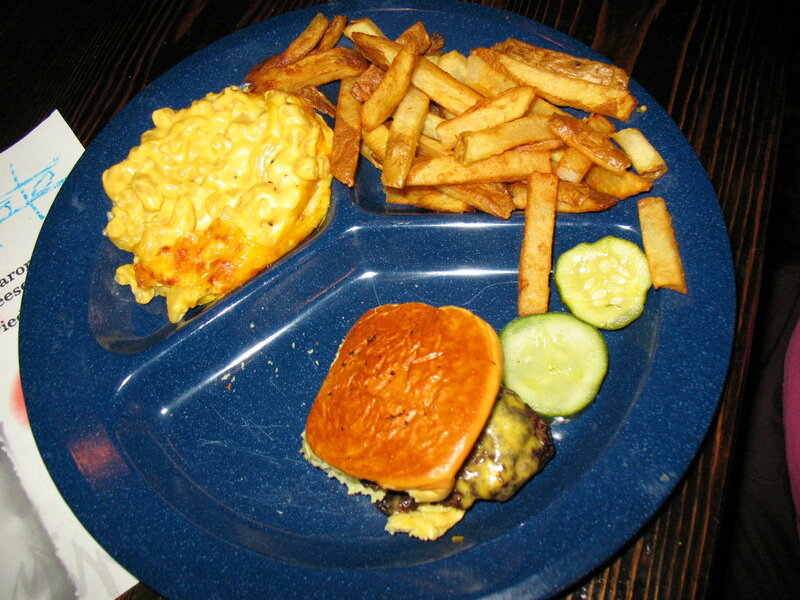 I couldn’t find the kids’ menu online, so from what I remember, there were cheeseburger, pulled pork, or brisket sliders; chicken fingers; macaroni & cheese; and a couple of other options that I can’t remember as main dishes, along with two sides. For the kids, food received mixed reviews. The chicken fingers, fries, and beans were enjoyed by all. 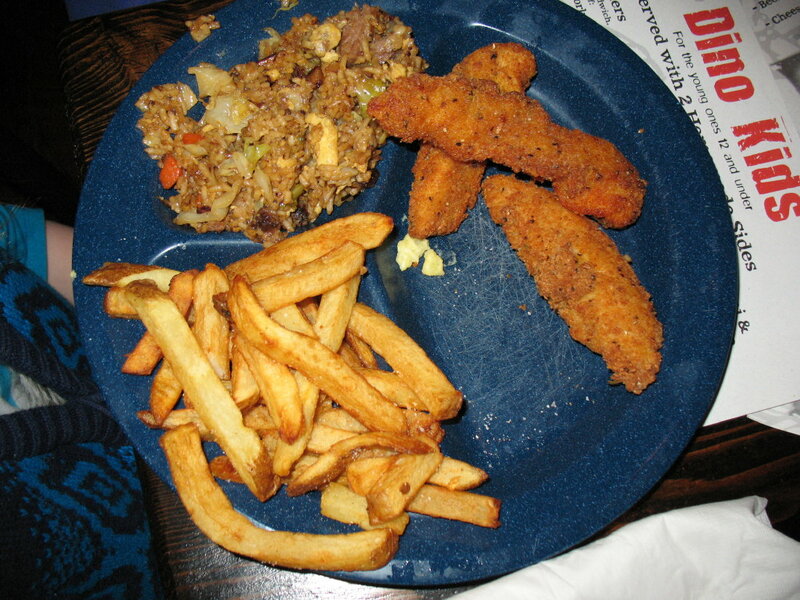 The fried rice was just too weird-looking for most of the kids to look beyond for the try. Usually my girls will give it a shot, but they focused on other options. They missed out, but I was happy to polish off their leftovers. The sliders were yummy but small. I know they’re sliders, but I had expected (without asking) two. The result was that the main dish was less than the sides, although, in fairness, it’s not as if the main dish is particularly more healthful than the sides, anyway. I mean, one doesn’t go out for BBQ for one’s health. But if you have a bigger kid, I’d ask for two sliders if that’s what your child wants to eat. Adults relished the macaroni & cheese, but it was too spicy and peppery for most of the kids. In fact, one of our young friends had recklessly ordered mac & cheese as both a main dish and one of her sides, so she was quite brutally disappointed. However her dad and (currently nursing) mom were happy to take on the burden of finishing it off for her. If your child’s a mac & cheese enthusiast, I’d suggest that you let her try some of yours before making a commitment. By the end of the meal we were all too full for dessert. Cute W even waved off his free birthday pie, which is just inexcusable, in my opinion. But meanwhile the kids were getting antsy, as you can tell, and there were roughly a gajillion people waiting to sit down and eat. But it was so tasty and enjoyable that people were scheming to plan a regular party–the only way to reserve the room–and get together every few weeks. The servers left us with a stack of temporary tattoos for the kids. 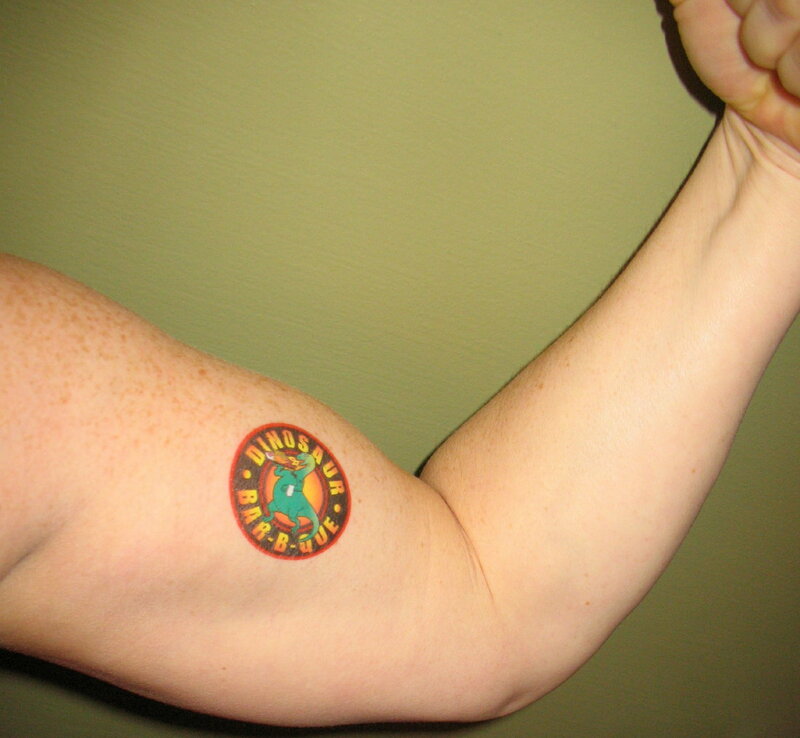 Who doesn’t like temporary tattoos? Yeah, I was waiting for the crowds to thin, too, but they just never did. And the ribs kept calling me. . . .